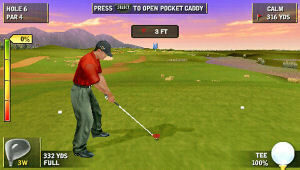 Tiger Woods dominates the game of golf both on the PGA Tour and in video gaming. On the PSP he is back for his third round in Tiger Woods PGA Tour 07. Does the game continue Tiger’s reign as the champion of video golfing or does it come up short of the cup? Good question, which is I went out on the video links to find out for myself. Tiger Woods 07 begins with you. Well the video game version of you that is. You start with the create-a-golfer tool to make a virtual version of yourself or your vision of the ideal golfer if low self-esteem prevents you from fantasizing about your own glorious career on the PGA Tour. The tool is incredibly versatile especially when you consider that it outclasses a lot of the character creation tools found in games for home consoles. You can tweak a number of facial features from chin size to eyebrow bushiness and use these to create a unique game character for yourself. Once you are done spending way too much time on your golfer, it’s on to the game’s optional but excellent tutorial mode, and then you’re ready to hit the links. Once you do head out on the course you’ll find that your drives are a bit on the wimpy side and that your chips just can’t seem to bite the green with the kind of backspin you see in the pros. This is because the game rates your golfer in a number of categories and you start out pretty much at the bottom. You’ll be able to improve your stats with play and by buying special clothing items at the game’s pro shop and eventually you’ll be able to give Tiger a run for his money. To swing the club in PGA Tour 07 you use the analog nub. Pushing it down will start your backswing and then when you’ve reached the desired power on the swing you push it forward to follow through on the swing. It works well enough, but not quite as nicely as it does with a stick on the home-based versions of the game. The nub is also not entirely precise and it can be tricky not to add a little push or draw to the swing by moving the nub slightly to the right or left while moving it forward. The power of the shot can be modified by tapping a shoulder button during the backswing and you can play with the spin on the ball while it is in flight. When putting the green is overlaid with a grid which uses blips moving along the gridlines to indicate the degree of the slope and break of the green. This is a good system on the console versions of the game but on the PSP’s small screen it is difficult to get a read on the longer putts. The game includes a putt cam that follows the line your shot will take if you hit it as it is currently lined up. This certainly helps, but it/s still a bit imprecise and tricky to tell if you’re indeed lined up so even some putts that look like they’re lined up well will go astray of the cup. These annoyances can cause frustration at times, but overall they’re not enough to spoil your golfing experience.